I knew my whistle worked but there was and still is a malfunction! Oh well with all the money FS1 and NBCS are making from carriage fees and commercial time slots does it even matter? The demo subject has been beaten to death. 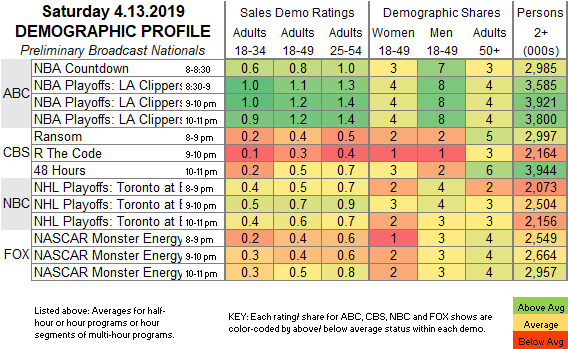 There isn't a single sporting event from last weekend that attracted over a million viewers and had more than half of its total viewers in the 18-49 demo. The men's NCAA Final Four games both had more than 2/3 of their total outside the demo. The women's championship game had about 60% outside the demo. Smaller college games were worse in this regard. PGA, worse. Yet the NCAA tournaments aren't trending downward commercially or otherwise. Just the opposite. It is true that the ideal sports demo is either 18-49 or 25-54 depending on the sport. Yet analyzing this only by percentage or ratio is simplistic and not effective. Would NASCAR or the NCAA be better off if they found a way to lose millions of 50+ viewers to make that ratio look better? Hardly. So many of the gimmicks and knee-jerk format changes many of us complain about were blatant attempts to morph NASCAR racing into something younger viewers would care about. Didn't happen, and more of that won't fare any better. Young star personalities winning races would to some extent, but that can't be forced either, unless you want them to start scripting it. Team Penske, LewTheShoe and Joker like this. 296k for the IndyCar race...man, that NBC contract is an unmitigated disaster. Wouldn't surprise me if the series were dead within a decade. AuzGrams, Joker and IanMcVittie like this. While I think the vast majority of NASCAR’s initiatives have been horse bleep including this year’s dumbed down rules the unpredictability of the initiatives is like watching a train wreck. Live attendance at non-oval venues looking positive. I don't think they have been making much TV revenue outside of the 500 for a long, long time. Most of the money NBC is paying is for that, honestly. Can the series be sustained on that? They've gotten through worse periods. Fair points. Whatever the financial component of NBC's deal is, it must be at least better than what Disney offered because I can't why else they'd turn down more exposure. And it's still better than the numbers during the dying late Champ Car days and early post-merger numbers on VERSUS. KodiakRusty89, IanMcVittie and gnomesayin like this. If you re-fruit it, why not post your source and your version of the numbers. Just calling someone wrong doesn't make you right. IRL racing would fold and I doubt Nascar with their numbers can sustain the track. IanMcVittie, Kiante and gnomesayin like this. Looks like somewhere between 2.4-2.6 million. Not bad for a Saturday night going against the NBA and NHL. Not bad at all. Looks closer to 2.7 or so to me, but the final numbers will be more accurate. The age demos really aren't that different than the NHL audience. The NBA is obviously known for skewing younger. Joker, LewTheShoe and Kiante like this. There are way too many people watching 48 hours. Also I spent most of the night switching between boxing and the race, post season nba and nhl is too long drawn out to give a crap about the first two rounds. Once the conference games and finals begins, I might watch occasionally. I’m surprised that a niche sport like the NHL did so well against Nascar coverage. It would be interesting to see what the ratings for the programs looked like in Canada. The Flames-Avalanche game that went to overtime was a good one! My dad and I watched the race but flipped to the Clips-Dubs game or Leafs-Bruins during commericials. Would that count us in all three? If you're not a Nielsen monitored household (there are about 40,000 that they use to arrive at estimates), it doesn't matter what you do for the purposes of these ratings. If you were, that's a good question, and it depends on at how many increments they are recording what you are tuned to. They report audience levels by hourly and overall average. Turtle84, LewTheShoe, aunty dive and 1 other person like this. If you watch for five minutes in a quarter-hour period you're factored into the average. That's why the "peak" rating is given for a particular quarter-hour segment. But yeah, fair chance that very few people here factor into the ratings at all unless they're streaming FSGo, and even those streaming figures aren't often released by FOX or whoever. It's not as straightforward as the social media ratings Nielsen does. Turtle84, LewTheShoe, Joker and 1 other person like this. Shannon Spake doing her best to help TV ratings. NASCAR Cup Series racing from Richmond (Va.) delivered a 1.8 overnight rating on FOX, up a tick from last year (1.7), but down a third from 2017 (3.3). It was the sixth of nine races this season to post an increase in the metered markets. Despite the bump, the 1.8 is tied as the second-lowest for a Cup Series race on broadcast television since at least 2000. Maybe it has leveled off. An up tick is better news than the other direction. I hope for good news after every race. Kudos NASCAR!!! Ventisca, KodiakRusty89 and gnomesayin like this. I've always wondered, is there anyone that tunes in to watch anything based on previous ratings? I don't. Could care less about ratings. Ratings? We don't need no stinkin ratings!!!! Omg there was aero wake though! How could this be! Spotter22 and mack like this. Wait, 2017 got a 3.3? Even for 2017 that seems.... high for some reason. I've always wondered, is there anyone that tunes in to watch anything based on previous ratings? I certainly don't base my viewing on the ratings. I watch what I like. First stable year in awhile with no big names retiring and the ratings level out. Can't say I believe it's all because of that, but it does make me wonder. Turtle84 and LewTheShoe like this. Sunday afternoon race in 2017, not Saturday night... so higher TV ratings but empty grandstands. Ah, I forgot how fickle the fan base is anymore (Richmond was highest TV market). It will be Sunday afternoon next year with Trucks I think on Saturday night. I can't find other references to the 2017 April Richmond race getting a 3.3 rating. The Jayski 2017 TV ratings page reported a 2.7 overnight, and the Wikipedia page for the race lists a 2.7 overnight and 2.9 final. I think the 3.3 is a mistake, as 1.8 wouldn't be down "a third" from 3.3, but more like 45%. It is down a third from a 2.7. That Paulsen guy from sports media watch, (I wonder if ESPN is paying his salary) somebody must have beat him with a Nascar die cast when he was a kid, he sure tries his best to do a weekly hatchet job on Nascar. Going back 19 years? It’s especially hungry among some of NASCAR’s “fans” and it doesn’t help if the cook never sleeps. I agree....everybody needs somebody I guess. I have often wondered if a race like Saturday's had been run "back in the day" with the greats of that time with a similar result if it would be heralded as the "great racing" NASCAR fans apparently crave. I couldn't take my eyes off the TV watching Bowyer work his way up to MTJ, then Logano's last run to MTJ with laps running out. It was also satisfying to watch MTJ (shut up booth, we already know) and Cole Pearn finally making it to Victory Lane at this track and with their new race org. Bowyer sending MTJ up the track would've been better racing, to see if he could extend the lead or get the revenge bump -- but the three car chase to close out the race made my Saturday night.